Hi all. I am so excited to review The Complete Tales of Beatrix Potter tonight. This is one of my absolute favorite children’s authors. There is just something about her beautiful stories, timeless characters, and inspiring ideals that I love. 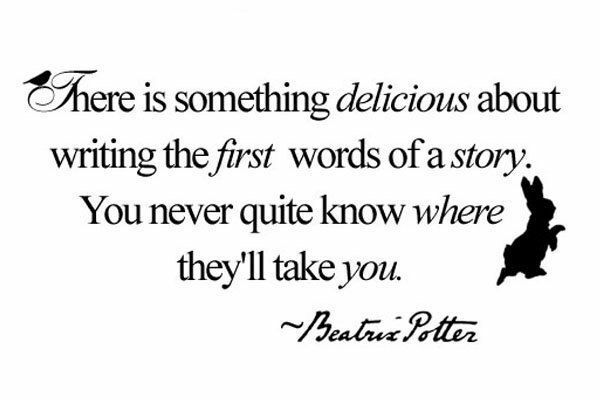 I bought a set of Beatrix Potter books in the Lake District on my study abroad there. I actually walked past the store first and didn’t buy them. So a friend and I went back early the next day and walked the almost 2 miles to Ambleside to buy them. When my husband and I went back to the Lake District 2 years later, I insisted we visit Hill Top (Beatrix’s home). It is a bit tricky to get to (train, buses, and shuttle) but so worth it. It was perfectly Beatrix. Miss Potter has been one of my favorite movies for years. Renee Zellweger is brilliant, Ewan McGregor melts my heart, and Emily Watson makes me laugh. I seriously cry and laugh and sigh every time I watch it. Our nursery is Beatrix Potter themed including framed pictures of my favorite characters (Jemima and Peter especially), a darling crib skirt from my mom, and a very intricate baby quilt I made with my mom when I was pregnant with my first baby. It has over 100 little squares. I love it and I will never make such an ambitious quilt again. And of course, we have several copies of various Beatrix Potter stories. A favorite author like this deserves the spotlight on my blog, that’s for sure. I have read many of her tales before, but it was fun for me to read them all in a row to see how the characters dance between stories and the stories dance into my heart. The Complete Tales of Beatrix Potter are a collection of stories varying in length from a few pages to several chapters. These 23 total tales follow various story lines of rabbits, cats, mice, frogs, geese and more. Some are more well known like “The Tale of Peter Rabbit” or “The Tale of Jemima Puddle Duck” while others are lesser known like “The Tale of Little Pig Robinson” or “The Tale of Mrs. Tittlemouse.” All offer darling characters and sweet morals. Some make me laugh, some make me smile, and some make me confused. But they are all so fun. There is something so timeless and so endearing about Beatrix potter’s characters. 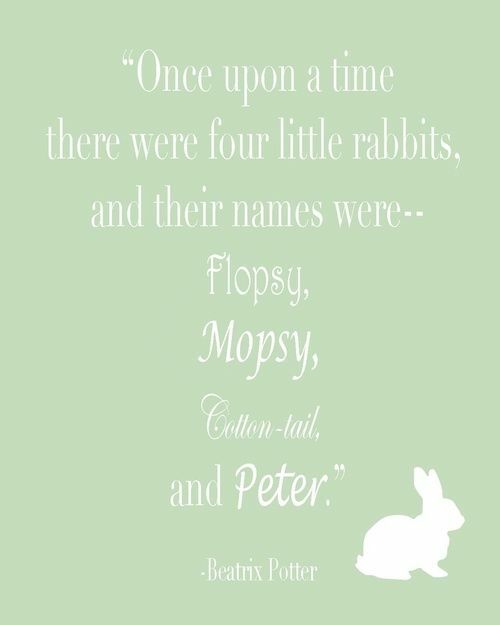 Some of my favorites have always been Peter and Benjamin Rabbit, Jemima Puddle Duck, and Jeremy Fisher. I love them because they are classic and the stories are simple yet memorable. I love Jemima because she is independent and ridiculously naive. I love Peter because he is curious and a bit too daring. I love Benjamin because he is adventurous and silly. And I love Jeremy because he is simple and wise. I remembered so many of the stories from my parents reading the books to me as a child. There were my favorites like those I mention above, but also others like about Mrs Tiggy Winkle and Tom Kitten. What sets Beatrix Potter apart is her ability to create these likable and memorable characters from ordinary animals and situations. There is nothing especially unique about a rabbit eating veggies in a garden. But Beatrix makes it special. And that special skill makes every one of these characters timeless. Random moments were familiar to me like Tom Kitten getting wrapped up in dough and the two bad mice stealing the cradle. Even the nursery rhymes seemed familiar to me. I love how celebrated and enduring these tales are. They stick with us and remind us of the joys and simplicity of childhood and imagination. What surprised me is all the stories that I don’t remember reading before! Ironically, I feel like these were also the most long-winded and least engaging stories in the collection. And some of these really were hard to get through. I was almost shocked when I came to stories that I didn’t enjoy as much as I remember always enjoying Beatrix Potter. For example, the story about Pig Robinson was a bit dragged out for me–it read more like a novella than a children’s picture book. And the story about the badger stealing Benjamin Bunny’s children and living in the fox’s house was a bit weird. What I really want to do now is read more about the timeline of her writing. Some tales felt more immature than others and I am curious about when she wrote the more famous ones. Can we just talk for a minute about what a neat woman Beatrix Potter was? She was an advocate for saving the beautiful Lake District (one of my favorite places in the world! ), wrote and published timeless children’s books at a time when women did not do that, and overcame deeply difficult trials in her life. I really admire her. 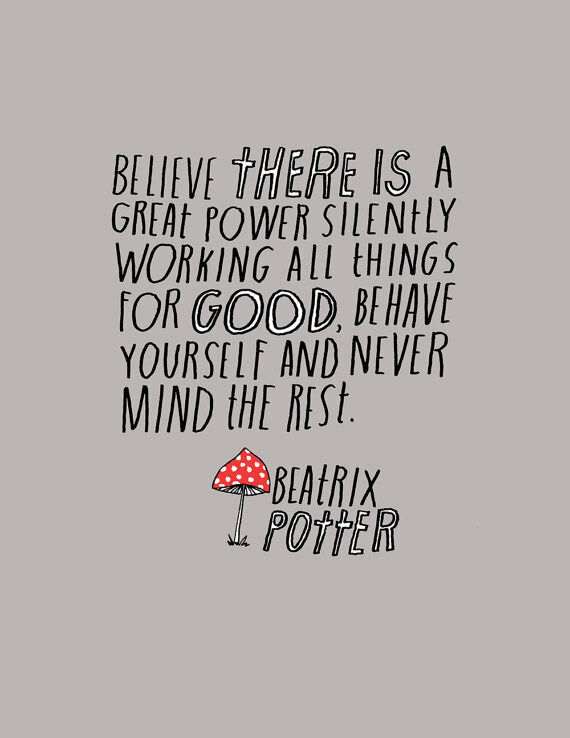 And I really love some of these quotes from Beatrix Potter. I think they capture the scope of her influence. 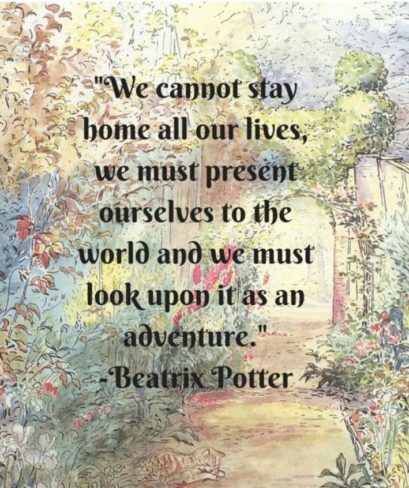 For me, Beatrix Potter’s tales will always be timeless and wonderful. These tales are perfect to read out loud to kids. They have the most gorgeous pictures. And the stories are lighthearted and fun overall. They also teach great lessons about obeying your parents, making smart choices, and learning from our mistakes. I love her talent for storytelling and hope to be reading her stories for many years to come! What are some of your favorite Beatrix Potter stories? This collection is the 11th piece I’ve finished for my list with The Classics Club! Check out my full list here. For more info on the club, click here. In honor of her art skills and the delightful characters she created with sincere personalities, ignore the current Peter Rabbit movies that make a mockery of her stories, characters and art work that is perfect as it is. Somethings in life are best as they are, and should not be ruined by someone’s ideas that their ideas are better than the original. If have talent, build on your own ideas, don’t scaffold off a classic. I love her original art and stories too! I haven’t seen any of the new movies and so far I have no interest. Thanks for the tips! Thanks for this enjoyable post. Beatrix Potter is a treasure. I agree and thank you, Marilyn! I think it’s so cute your nursery is Beatrix Potter themed!